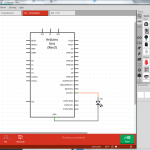 Fritzing is an Open Source piece of software used for the design of electrical circuits. Whilst Fritzing doesn’t do circuit simulation, it does design very, very nicely. You have probably seen some of the Fritzing graphics posted on the Arduino.cc website which is what initially caught my eye. First impressions upon loading is that it has a clean, polished layout with the interface being snappy and switching between tabs very efficient. High quality illustrations, including the Arduino (pictured above), breadboards and many components. Missing some parts? You can create your own components and save or share them using the built-in parts editor. A variety of export options, including PNG, PDF, SVG and also Etchable export formats. The PCB view is useful (and cool!) for displaying your circuits. There is a service to manufacturer your PCB design, however I have not used this service. Well, not really any bad remarks at all, only some feature requests. How good would this be with circuit simulation? Absolutely amazing, that’s what. Plus maybe an installer so I have start menu/desktop short-cut created for me but that’s not exactly important at this stage. This is still BETA software so you can expect the occasional bug here and there, but plenty of software updates. As Fritzing is written with C++ and Qt it has support for Windows, Linux and MAC. 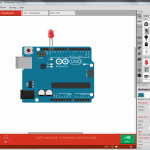 You can also download the source code on the Fritzing website. Keep in mind that the source code of Fritzing is licensed under GNU GPL v3, the documentation and breadboard view graphics under CC Attribution-ShareALike. Please do leave credit when creating and sharing your designs online. I haven’t been a Fritzing user for very long, so my apologies if I have missed something vital. This has got to be one of the best, free design tools available at the minute. You can download Fritzing from fritzing.org you won’t be disappointed. 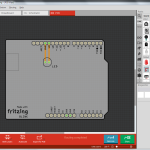 There are various tutorials, guides and FAQs on the Fritzing website.